You can add keyframes to deformers reposition their deformation controls to create animated sequences. In the Camera, Timeline view, select one of the drawing elements linked to the deformation chain you want to display. In the Deformation toolbar, click the Show Selected Deformation Chain and Hide All Others button. Rotate the first bone to rotate the limb. 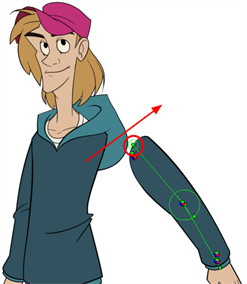 Rotate the subsequent bones to bend the limb. 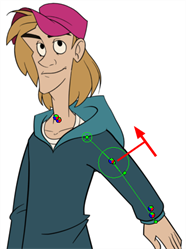 Use the control points to reposition the articulations. This will elongate, shorten, or change the direction of the bone and offset the subsequent children. In the Timeline view, go the frame on which you want to set the next key pose. 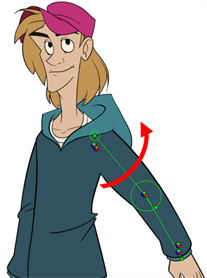 Repeat the previous steps to animate your character. 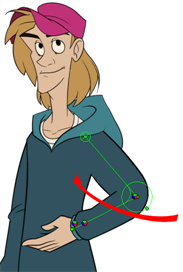 NOTE: When manipulating the articulation of a Bone or Game Bone deformer, you can hold the Alt key to lock the bone's angle and only shorten or elongate the bone. You can also hold the Ctrl (Windows/Linux) or ⌘ (Mac OS X) key to break the articulation off its chain and make it into a new, separate deformer chain. NOTE: You can also manipulate the deformer by typing values directly in the Layer Properties of the deformation effect nodes.